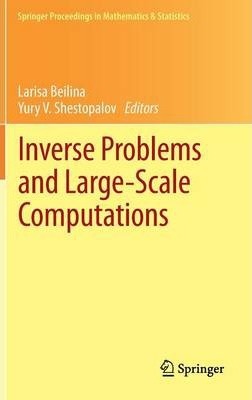 This volume is a result of two international workshops, namely the Second Annual Workshop on Inverse Problems and the Workshop on Large-Scale Modeling, held jointly in Sunne, Sweden from May 1-6 2012. The subject of the inverse problems workshop was to present new analytical developments and new numerical methods for solutions of inverse problems. The objective of the large-scale modeling workshop was to identify large-scale problems arising in various fields of science and technology and covering all possible applications, with a particular focus on urgent problems in theoretical and applied electromagnetics. The workshops brought together scholars, professionals, mathematicians, and programmers and specialists working in large-scale modeling problems. The contributions in this volume are reflective of these themes and will be beneficial to researchers in this area. Illustrations note 30 Illustrations, color; 26 Illustrations, black and white; X, 217 p. 56 illus., 30 illus. in color. M. Asadzadeh and L. Beilina.-V. P. Gubatenko.-J. Bondestam Malmberg and L. Beilina.-L. Angermann, V. Yatsyk et al.-.L. Angermann.-D. Valovik.-V. Trofimov, O. Matusevich, I. Shirokov, and M. Fedotov.-AP Smirnov et al.-A. Frolov and E. Kartchevskiy.-Y. Podlipenko and Y Shestopalov.-Y. Smirnov, Y. Shestopalov, and E. Derevyanchuk.-A. Samokhina and E. Trahtengerts.-V. Yatsyk.